Up until roughly 1960, we had an old Crosley floor radio and phonograph that sat in our dining room. The turntable only had the capacity to play 78 rpm records, and our selections were limited to say the least. I remember Mom would occasionally play some of the Big Band records that she had purchased years earlier. The records were full of crackles and pops, but we were still able to hear the sounds of Glenn Miller or Les Brown fill the air. In 1960, Dad decided to purchase Mom a modern piece of equipment that excited her beyond belief. The occasion was their wedding anniversary which was in October. I distinctly remember the day when he decided to give her the present. He wasn’t much into wrapping presents, and so he simply carried a huge cardboard box into the dining room. When Mom opened the box, she was speechless. 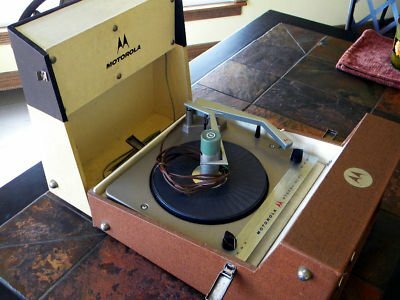 There before her was a sparkling new Hi-Fi Stereo portable record player! The speakers folded together on the front and were black with a glittery finish. When the speaker were opened, they revealed a silver glittery fabric. The rest of the casing was pink and as “mid-century modern” as you could get. I don’t remember the brand for certain, but it may have been Phillips, Motorola or Zenith. I have not yet been able to locate a photograph of the machine, but I found one that resembled it closely, shown on the left. Mom loved her new stereo. Imagine, being able to still play her old 78 rpms PLUS being able to buy and play new 45’s and LP albums! Dad had purchased the stereo from his friend Dom Torretti at Dom’s TV, so he knew he got the best. As an added bonus, Dad had received a box of 50 albums when he purchased the stereo. Granted, they were not the most sought after artists, but my parents enjoyed them. There were albums with the Ink Spots, Connie Boswell, Hawaiian music, Big Band Music, Tangos, Beer Drinking Songs (as if Duquesne men needed that type of encouragement!) and dozens of other genres. 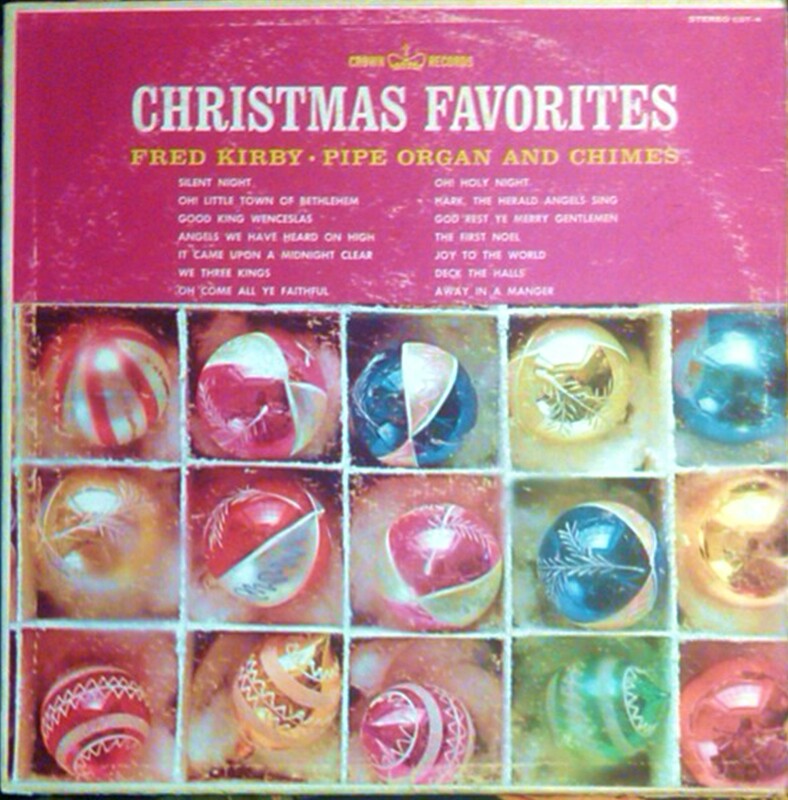 Surprisingly, among all of the albums, there were only two Christmas Albums. The first was an album featuring Jack Benny and Dennis Day. 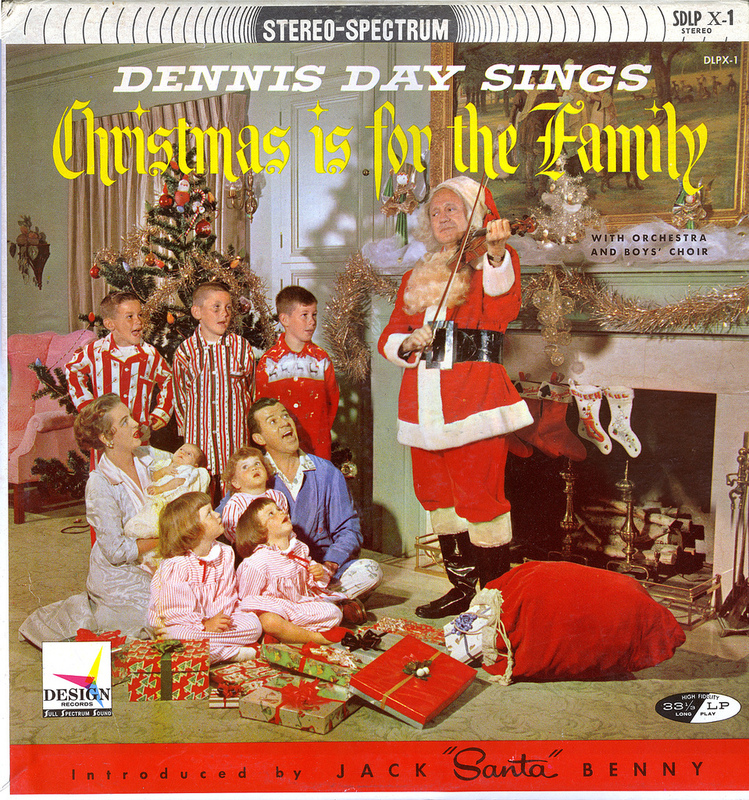 It featured a photograph of Jack Benny dressed as Santa Claus and standing in front of what appeared to be Dennis Day’s family who were dressed in their pajamas. Jack was playing his violin and the family appeared to be singing along. It was as hokey of a photo as you could come by, and the album was just as corny. There were songs performed by Dennis Day, some by Jack Benny and even some tracks containing dialog of Jack Benny and Rochester. Believe it or not, I still have the album and I still play it every Christmas since it immediately brings back the memories. Another of the freebies that Mom received was an album by Fred (?) that featured a pipe organ and bells. It was about as traditional of a Christmas album as you could find. Somewhere along the way, that album was either lost, borrowed or thrown away and I no longer have it. However, thanks to the amazing reach of technology and the internet, I was able to locate a copy of the records on eBay and now have it back in my collection. It too is dragged out every year and played, especially when I’m trimming the tree. Beyond all other Christmas music, the one album that immediately “brings it home” for me isn’t one that you would expect. In the early 60’s, as a student attending Holy Name Grade School, we were charged with the job of selling a Christmas album that was recorded by the Sisters of St. Joseph in Baden, Pa. The album was titled “In A Manger Lowly” and contained primarily just the voices of the sisters at the Motherhouse in Baden and occasionally some pipe organ accompaniment. 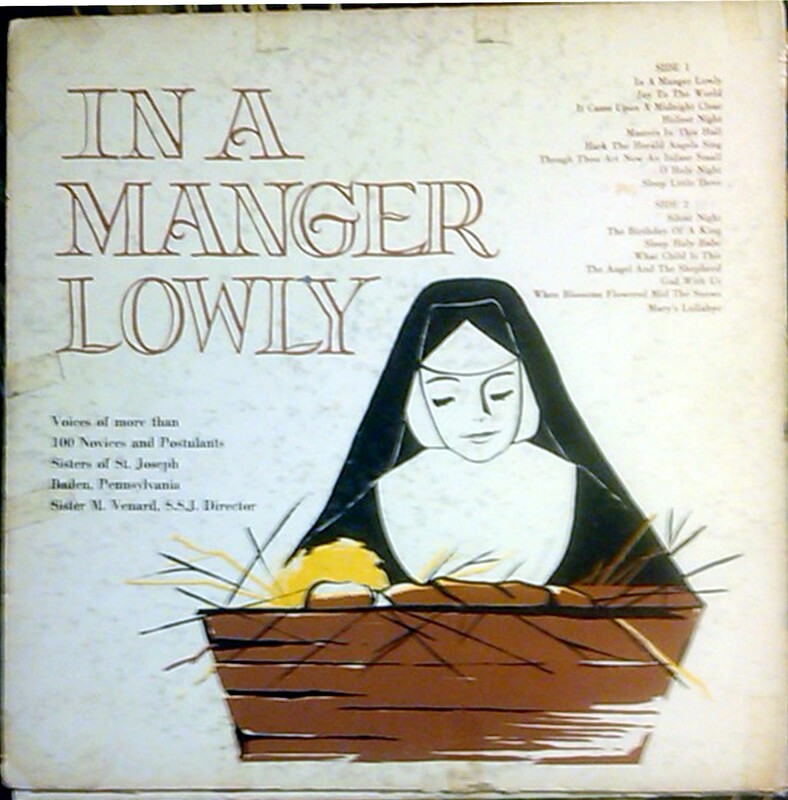 The feature carol of this record, “In a Manger Lowly,” was written in 1916 by Sister M. Victoria, S.S.J., who at present is completely blind, and a patient in the Sister’s Infirmary at Baden, Pennsylvania. Although handicapped, Sister still assists in the work of the community through her apostolate of prayer and suffering. It is the wish of Sister Victoria that all who hear this carol may have a special share in her daily prayers for the needs of all Christians. I spoke to Sister Sally, the archivist for the Sisters of St. Joseph in Baden, and she gave me some interesting information regarding Sister Victoria. The Sister was born on 8-6-1869 and died on 10-27-1963, a short time after the album was released. Sister Sally indicated that Sister Victoria was born the very year that the Sisters of St. Joseph expanded into Western PA. – Thanks for the information Sister Sally! Click HERE for CD order form. And so my friends, I hopefully sign off leaving music in your heart. I am heading up to Duquesne this weekend and will be staying for 5 days. I can’t wait to get home and I’m hoping I encounter some snow along the way as I did at this time last year. I will hopefully return with lots of stories and pictures to share with you. If there is anything you’d like me to check out, please leave a comment and let me know! Reading your e-mail brought back many memories for me. My parents bought their stereo at Dom’s , it is a console stereo that played the records and had an eight track player. My parents are gone but we still have the stereo and a lot of the records (many of them Polish) that they had. We also bought our first stereo at Dom’s. When I was in the Boy Scouts I remember going out to a Christmas Tree farm and cutting down trees and then decorating the roof on the convent at Holy Name with a Nativity scene. The Sisters had speakers on the roof and played Christmas music from their record player. We ordered the CD from the Sisters at Baden. Fantastic post! Have a Merry Christmas! Nice to hear you’re recovering and ready to travel “home”. Much joy and many blessings to you and your beautiful family. Enjoy, enjoy and then enjoy some more!! Merry Christmas to you and your family,Jim.Have a safe trip. Merry Christmas, Jim. I fondly remember going to the Goodyear and Firestone Tire Stores and purchasing the various Christmas albums they produced, I believe for over 10 years. As-a-matter-of-fact, when my father died I “inherited” all of the albums, many of which, are in decent playing shape. One other note is the music that would play on the streets of Duquesne when the “ringing bell” street lights were displayed. I still fondly remember walking down South Second street to the Nativity display in the snow and reveling in the sights and sounds. It was a simpler and more reverent time in the history of Duquesne and Western Pennsylvania. Unfortunately such things now would be high on the “offensive” politically correct list. Wow! What a rush I got when you mentioned the Sisters of St Joseph. My Aunt was the secretary to Mother Superior. I went there once for a retreat, but I didn’t stay long. I got a nose bleed that had all of the nuns praying for me as they rushed me to the E.R. I was sure I didn’t want to stay there anymore and was taken home. My aunt was kept aprised of my and my brothers school work. Aunt Margaret is gone now. But the memories are still there. Merry Christmas Jim! Safe travels!